Ugh, I can’t believe I missed 5 Books Friday this week. I was trying so hard to keep it going every week! Anyway, life got in the way of blogging, as it tends to do. Here’s a quick wrap-up of what’s been going on with me. For the last two weeks I’ve been covering shifts for the other girl who works evening shifts at Job #2. We have been calling tonnes of clients on our waitlist now that we have space in our program, but working 12 hours a day is taking a lot out of me. I just keep telling myself that the next paycheck will be SO WORTH IT. I made a commitment to myself to start being healthier. I’ve joined a gym (which was one of the scariest things I’ve ever done) and actually went twice last week. I have a lot of weight to lose but I’m tired of being tired all the time and not being as active as I once was. I figured that since this is the week I start my weight loss journey, that this book would be a good accompaniment. It’s really interesting, but I’m not relating to the main character as much as I thought I would. 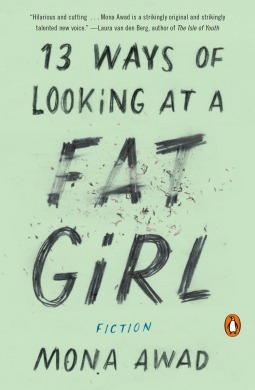 Of course, everyone has different experiences, but this book focuses almost exclusively on the sexual aspects of being an overweight girl/woman. She’s also a tad less practical than most of the women I know, with her obsession with high fashion and unending diets. I’m sure there are women out there who struggle as much with their identities as this girl does, but I’m not really one of them.